Anglers fishing with me, out of CB’s Saltwater Outfitters on Siesta Key, had good action catching and releasing snook and bluefish on flies in the ICW at night recently. 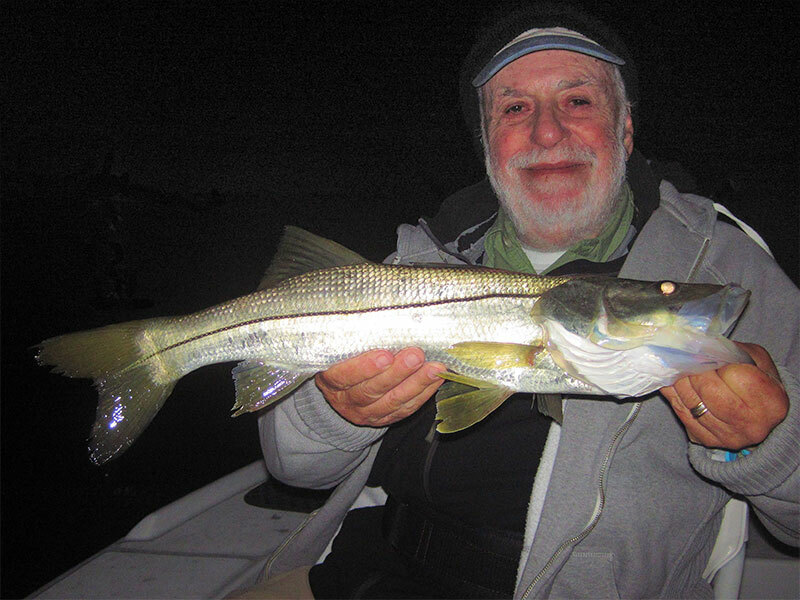 Catch and release night snook fishing continues to be the most dependable fly fishing option. Martin Marlowe had a great evening trip recently. 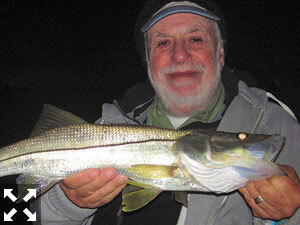 Martin Marlowe, from NY, fished the ICW at night for snook on a trip with me. He had fast action catching and releasing snook and several bluefish on my Grassett Snook Minnow fly. Great action! I will be speaking at the Florida Sportsman Show at the Lee County Civic Center on Sunday, Feb 9 on the Ankona Boats Fly Fishing stage at 10:30 AM on “SW Florida Winter Fly Fishing Tactics” and at 2 PM on “Fly Fishing for Snook at Night”. I’ll also be hanging out with my friends at DOA Fishing Lures and Mangrove Coast Flyfishers while I’m not speaking. Fishing dock lights in the evening is usually a good option for catch and release snook fishing this time of year, although it is dependent on tide and conditions. Fishing shallow flats is both challenging and rewarding. It usually requires fishing hard to find and catch fish. You may not catch big numbers of fish but you may catch some good ones.